Viruses are the smallest obligate intracellular parasites that require living host cells in order to multiply and being alive. 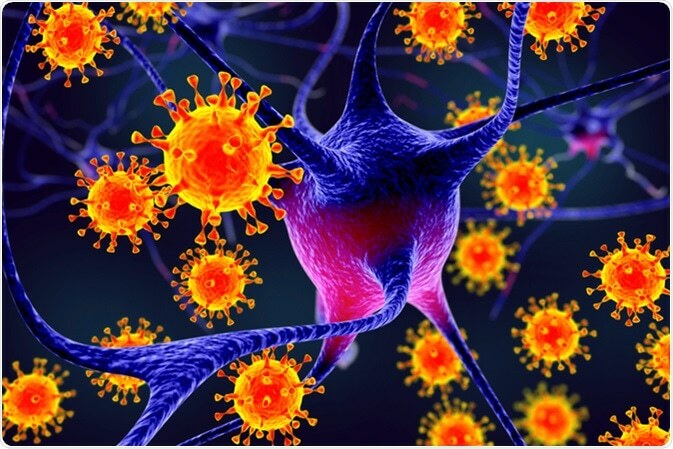 Viruses can infect any type of cell, ranging from human cells to protozoa. Viruses are small infectious agents that depend on living cells of other organisms for replication. They are composed of either RNA or DNA genome, which is surrounded by a virus-coded protein coat called capsid. The protein components that form capsid are known as capsomers. This core viral structure namely nucleocapsid is sometimes surrounded by a membrane called envelop. Some viral genome also encodes enzymes that are necessary for host cell infection. This entire viral structure with all necessary components is termed as virion. Different types of viral genome exist in the nature. It can contain single- or double-stranded DNA or RNA. In case of double-stranded RNA (ssRNA) viruses, positive-sense ssRNA can be transcribed to form messenger RNA (mRNA); in contrast, negative-sense ssRNA is complementary to mRNA. 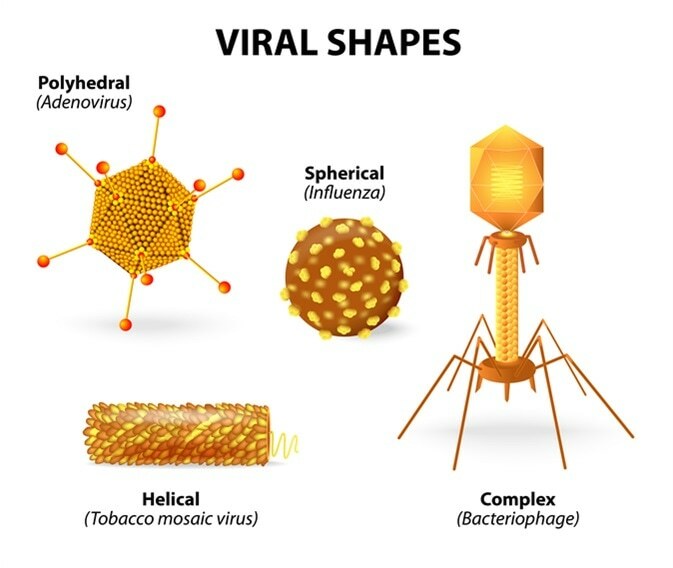 According to the shape of viral nucleocapsid, there are two types of viruses: helical and icosahedral viruses. In case of helical viruses, capsomers are arranged helically around the viral genome, giving the virus an elongated tube-like structure. In case of icosahedral viruses, icosahedral symmetry containing 20 equilateral triangular faces and 12 vertices gives the virus a spherical shape. Apart from these structures, some viruses including pox virus and bacteriophage possess completely different architecture, and thus, grouped as complex viruses. Viral replication is a multistep process that involves highly specific interaction between virus and host cell. Outside host cells, viruses are metabolically inactive and cannot replicate. The replication process initiates by binding of specific components present on the outer surface of virus with cell surface receptors of the host. This process is called attachment. 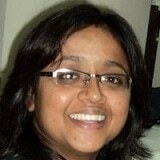 In the next step, either entire virus or viral genome enters into the host cell through penetration. In case of naked or unenveloped viruses, mostly viral genome enters the cell and capsid is kept outside. In contrast, most of the eukaryotic viruses inject the whole capsid into the host cells, and capsid is subsequently separated from the genome in the cytoplasm. In case of unenveloped eukaryotic viruses, endocytosis is a frequently used process for capsid entry. However, enveloped eukaryotic viruses generally enter the host cell through fusion between viral envelop and host cell membrane. Once inside, viruses use host cell’s replication machinery to replicate its own genome. This process differs between different viruses depending on the viral genetic material. Viral genome that is different from host’s double-stranded DNA genome can undertake various strategies to continue replication and protein synthesis. In this context, specific viral enzymes, including RNA-dependent RNA polymerase, play a vital role. After replication and protein synthesis, all viral components should be assembled in an organized manner. This process is less complex in case of simple viruses containing only three kinds of proteins; whereas, complex viruses that contain as many as 60 proteins must undergo multiple complex steps. Once properly assembled, newly formed virions are released from the host cell by two different mechanisms: cell lysis or budding. In case of cell lysis, virus components burst out the host cell and destroy it. Once released, virions are ready to infect new host cells using the same procedure. Budding is more common among enveloped viruses. In this process, newly formed virions are released from the host cell one at a time. Mechanistically, a virion modifies host’s plasma membrane by inserting its proteins and entire capsid then pushes out through this modified portion, turning the plasma membrane into a viral envelop. Viruses can be spread through various ways, such as inhalation, swallowing, insect bites, sexual transmission, and contaminated blood transfusion. The most common outcome of a viral infection is host cell death (virulent infection). In contrast, some viruses can stay inside the host cell for years without causing any harmful effect (latent infection). In addition, viruses that undergo budding are released one at a time, causing persistent infection. Some viruses are also known to inactivate tumor suppressor proteins of the host cells by binding with them. This leads to uncontrolled cell growth and eventual formation of malignant tumors through a process called transformation.